5.6" high-bright automotive grade color TFT LCD, 2-camera inputs, front controls, flush panel mount, auto-on in reverse gear, and rear view image appears automatically when selecting reverse gear. 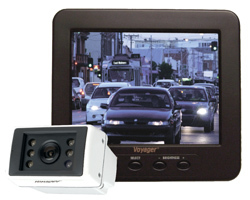 Also includes color Night-Vue® camera, metal mounting bracket with angle adjustments, and 65' cable. Great for Class C motorhomes.